The above image uses 2 area lights scaled to the windows. Each has identical settings, as seen below. I also used a single bounce in my FG options. So now for the portal light. 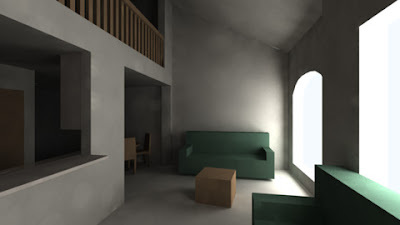 in Maya2008, this is a light shader and should be connected to an area light. Here are the connections. The portal_light now becomes the root of your light control. So I fiddled with the intensity multiplier (set to 5) to imitate the general look of my earlier area lights. The result is below. I've also reposted the original image below the new one, to compare. You can see the original image has FG issues like discernible ray splotchiness. The new portal image cleans up these issues with roughly the same render time. Cool tut...I look forward to your next lightportal extra - cheers! 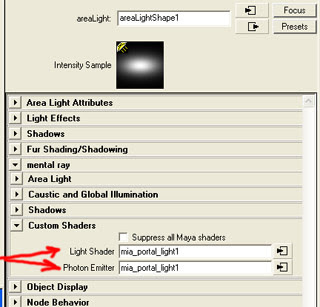 "PHEN 0.3 error: Shader 'mia_portal_light' must be applied to a VISIBLE rectangular area light to work correctly!" 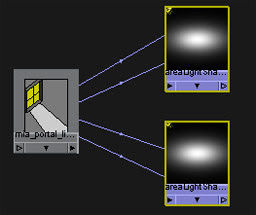 "PHEN 0.3 error: Shader 'mia_portal_light': Light direction must be 0 0 z"
which I google it a bit and got rid off....however it still black.....why??? 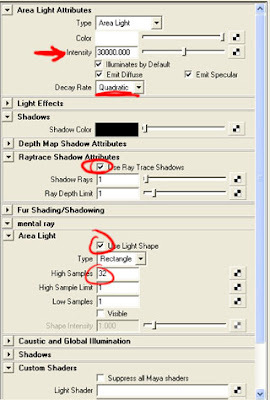 I am having a huge problem with how my lights interact in my scene by doing the following: When I connect the portal light into both custom shader slots of the area light, why when I render I keep getting this error: getting photon emission shader returned miFALSE: aborting photon tracing. But when I dont have the portal connected, no error come up? Could someone please explain. Thank you.